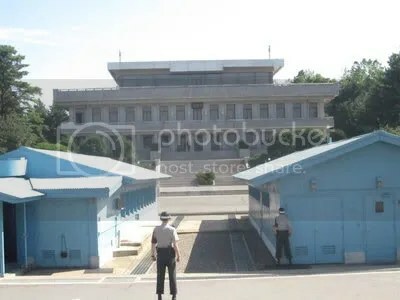 Why is the Korean Demilitarized Zone such a fascinating tourist attraction for the millions of local and international visitors who flock there each year? According to Suk-Young Kim, Associate Professor of Theater at the University of California Santa Barbara, “there are multiple discourses that attract people to the ‘living relic of the Cold War front.’” These discourses involve contradictions and tensions especially in relation to the two prevalent narratives that dominate discussions of the DMZ: ethnocentric nationalism and environmental globalism. For Dr. Kim, the decision to focus her research on the tourist city of Imjingak as opposed to Panmunjum — a village located on the border of North Korea and South Korea — relies on practical reasons: “As a South Korean citizen I was not allowed to go to Panmunjum [as] South Korean citizens are not allowed to take part of the Panmunjom tour.” Dr. Kim quickly disclosed that Imjingak is “very much the place, for South Koreans at least, that resonates as the closest place you can be to the lost hometown areas [in North Korea].” Ironically, although Imjingak may resonate as spatially closest to former hometowns, for many South Koreans, Imjingak’s wide-open space is far from urban, polluted Seoul — the city that many South Koreans call home. Dr. Kim’s “choice” to focus on Imjingak also calls attention to the hypocrisy in the fact that South Korean nationals lack access to the strip of land that splits many of them from their family members while Americans and other tourists have right of entry to this site. Imjingak’s departure from the more conventional forms of tourism is also highlighted in the juxtaposition of monuments that invite visitors to mourn the separation of families against the “elements of fun, pleasure and recreation.” These traces of fun appear in various sites throughout the area: an amusement park, the train exhibitions and the storyteller near the Bridge of Freedom who narrates his family’s migration to South Korea with much humor. As Dr. Kim explained in her lecture, elements of pleasure are also found in popular culture’s representation of the area. While the very presence of contradictions may be unsettling for some, the seemingly incoherent relationship between trauma and pleasure may produce the possibility for contesting dominant history. After all, in a space where each Korea gains legitimacy from the demonization of the other Korea, these contradictions work to challenge stifling state accounts. Perhaps the presence of both trauma and pleasure or even the pleasure in consuming trauma also produces possibilities for representing trauma without perpetuating the psychological effects of violence. Dr. Kim disclosed: “Through this long sustained state project of mourning national trauma, we are all exhausted at one point. It doesn’t mean that we have to engage in historical amnesia, but I think that this fatigue syndrome is finally breaking up a certain aspect of counter-narrative in redesigning this space.” Incorporating pleasure activities into the process of contemplating the violence that the DMZ represents for Koreans allows for a potential alleviation of the stress and fatigue associated with mourning and trauma. Dr. Kim contends that this transition from trauma to leisure is facilitated by the manufactured value of the DMZ as an ecological sanctuary. The construction of DMZ as a nature reserve can be traced back to the 1970s, and the impact of its perceived environmental value can be found on Injimgak’s observatory deck. Here, Dr. Kim explains, “beautiful imagery of nature taken from the DMZ are on display as [if] this pristine image from nature taken from the DMZ is the projection of the ideal future.” The investment in such an idealized future helps explain why environmentalists have fought to protect the area inhabited by a few rare species, but the interview with Dr. Kim suggests that the area is also littered with landmines: “It [the DMZ] is literally not that pristine. The environment was severely damaged during war.” Not only was the environment harmed but also the legacies of the Korean War and the Cold War remain. Dr. Kim proposed during her talk, “Before we talk about the global environmental forces wanting to claim the space…clearing up the war legacy should precede those plans.” The physical remains from decades of war must be dealt with before environmental concerns can become the sole focus. However, Korean ethnonationalism threatens any claims that global environmentalism can make to the land. Dr. Kim argued, “There is a prevalent sentiment among [the] South Korean national imagination that this is a temporary transient space. It cannot be a permanent scar on this national landscape…[but] it should be opened up once Korea becomes one, no matter what unification might be.” As a site whose future is undetermined, these Koreans will do everything they can to maintain the status quo in hopes of a future resolution between and reunification of North and South Korea. In offering a comparative analysis, Dr. Kim also highlighted how the absence of discussion among North Korea’s powers structure suggests that “[the DMZ] is a place of national shame, a place that works against their claim that the Korean War was a victorious war for North Korea. I interpret it [the absence] as North Koreans seeing it as a source of shame that should be eliminated if Korea were to be united.” Although both Koreas may seek to omit the DMZ from their collective memories through reunification, the concept of reunification or one nationhood is actually borrowing from a framework developed during the colonial period. Perhaps the assumption of a supposedly stable identity among Koreans that should result in reunification is something that should be interrogated. The simultaneous presence of ethnonationalism and global environmentalism is not a recent phenomenon. Dr. Kim argued, “the paradox…was there in the 70s and is still there today.” For example, Dr. Kim revealed that the two Koreas “negotiated trade for a very short period of time” with the “direct operation of trains across this ecological sanctuary.” It seems that despite nearly forty years having passed, very little has changed in these two movements’ positioning regarding the DMZ. Dr. Kim distinguishes Imjingak from other sites by acknowledging, “what’s interesting is that as a place to commemorate the past, Imjingak is different from places like the Berlin Wall, which really belongs to the past tense.” For Koreans, the demilitarized zone is still a contemporary presence that has yet to be resolved. The unstable present and future of this space renders both the site itself and the notion of time incredibly volatile and in many cases completely irrelevant. The DMZ is a place fraught with multiple contradictions where discourses around space, time and bodies are regulated by the state to produce a more coherent narrative. However, this coherence can also be read as incoherence, as the DMZ becomes a place where teleological and linear conceptions of time and space do not hold. Dr. Kim concluded her lecture by acknowledging: “I think that I’ve done more to create the messiness and to raise questions than to actually answer questions.” Perhaps Dr. Kim’s concluding statement is helpful in acknowledging how sometimes it is more productive to produce knowledge by inspiring more questions and examining alternative possibilities through contradictions. In other words, maybe the DMZ and Imjingak exemplify how an incoherent narrative is imbued with knowledge through the alternative possibilities conveyed in contradiction.